Baby Parker with his big sister Maddison. 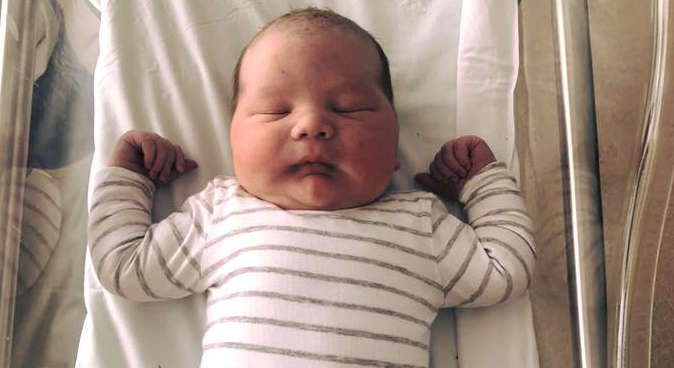 A Riverstone mum has given birth to one of the biggest babies ever born at Blacktown Hospital. Parker James Bell entered the world on Thursday weighing 5.755kgs (12lb 6oz). Nikki, 28, and Michael, 30 have received multiple media interview requests about their bundle of joy, with their new son appearing in the Daily Telegraph today, Sunrise this morning and an appearance on the Today Show on the way. Baby Parker is a big boy. Photo: David Swift, The Daily Telegraph. Nikki delivered Parker via vaginal birth and the birth took approximately 2.5 hours. Parker is in good health and is at home with his big sister Maddison, who is 20 months. Nikki told the Daily Telegraph that her efforts during labor weren’t any more remarkable than others. “I’m sure all births hurt, whether it’s 1.7kg of 5.7kg — they all hurt,” Nikki said. Parker’s adorable cheeks on display. The average weight of a newborn is 3.5 kilograms, though the range of normal can be between 2.5 and 4.5 kilograms. Blacktown Hospital midwife Alex Smee said the mother’s involvement in the facility’s Midwifery Group Practice (MGP) program greatly supported Nikki during the birth. Midwife Alex Smee and consultant obstetrician Dr Marisa Martin with baby Parker. MGP is a continuity of care model available to women birthing at Blacktown Hospital. “We have a firm belief that women grow babies that are very appropriate for their size and that they are able to handle during labor and birth. “The MGP program has supported Nikki to birth her baby beautifully. Registered midwife Alex Smee helped Nikki deliver her baby Parker. “We believe it allowed her to feel confident and empowered during birthing time. “We are always in awe with what a woman can do on the day of her birth. This story was originally posted on the Blacktown Midwifery Facebook page.